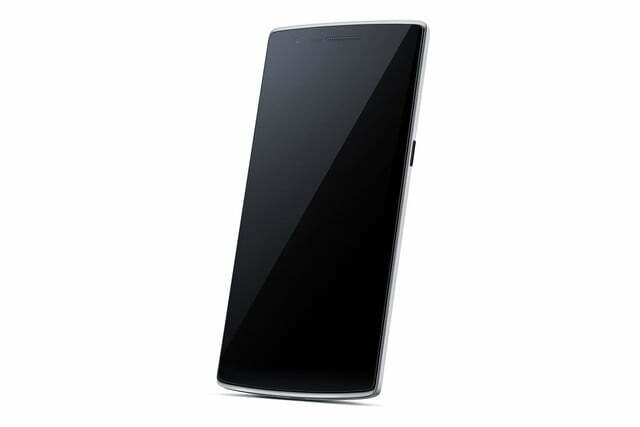 OnePlus, a company which only made itself public in December last year, has launched its first smartphone, the OnePlus One. On paper, it’s more powerful than a Galaxy S5 or HTC One M8, but at $300, it will cost less than half their price. The device was unveiled at an event in Beijing, and the proceedings live tweeted through the company’s official Twitter account. 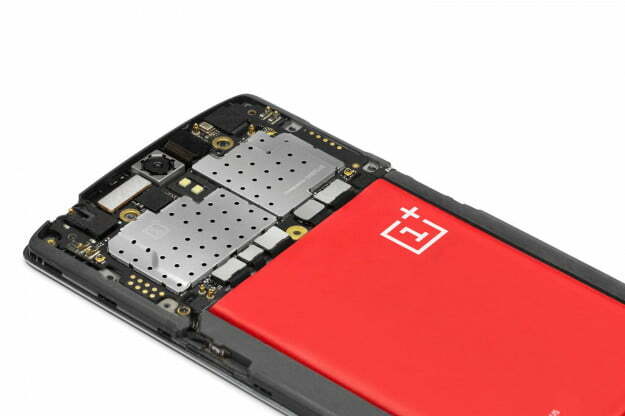 We’re excited about the OnePlus One, and although the majority of the technical details had already been revealed, we still hadn’t been given a good look at the phone itself. Updated on 04-30-2014 by Andy: OnePlus has shared its production schedule, giving us a better idea of when the phone will be available to buy. You can also try to win a phone by smashing up your old one. An exact release date hasn’t been confirmed yet, but OnePlus has shared a production schedule, giving us a good idea of when we can expect it to go on sale. 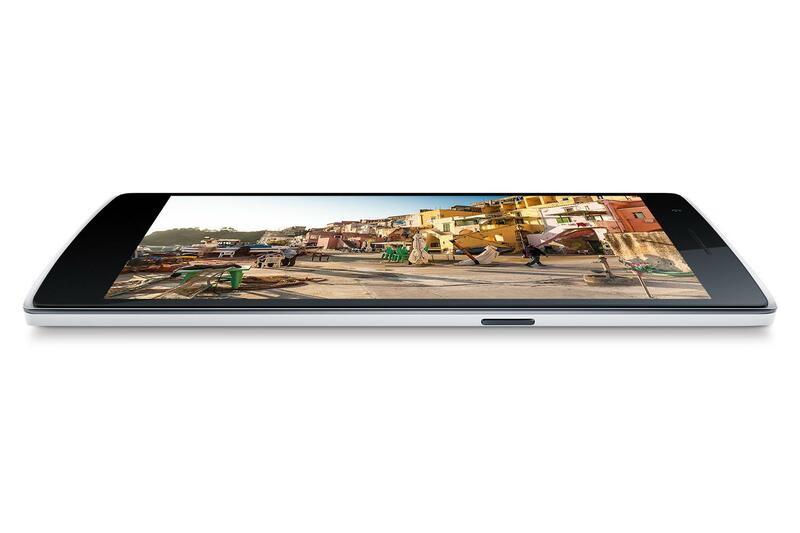 In mid-to-late May, the first batch of 16GB white phones will be made available to those with an invite, followed by the initial run of 64GB black phones in early June. We’re told to expect increased availability in late June, at which time invitations will have become widespread. OnePlus will sell its first phone to customers in America, the UK, Canada, and the following other countries: Austria, Belgium, Denmark, Finland, France, Germany, Hong Kong, Italy, Netherlands, Portugal, Spain, Sweden, and Taiwan. OnePlus One will cost only $300 in the U.S.
OnePlus promised the phone would cost less than $400, or 350 euros, when it goes on sale. It delivered too, and confirmed the Silk White 16GB model will cost just $300, while the Sandstone Black 64GB phone will be $350. In the UK, the 16GB phone will cost £230 and the 64GB £270, and in Europe the prices are set at 270 euros and 300 euros respectively. OnePlus will implement an invitation system for early buyers of the One, calling it a “user friendly way of buying the device.” The company claims it wants to avoid the pitfalls that come with traditional pre-orders, such as difficulty in securing a device, and long wait times. OnePlus will distribute invitations to buy the phone through its busy forum, contests, and through friends. Once you have an invite, you will 100 percent know you’ll be able to buy the device. However, the invitations are in limited supply, so there’s no guarantee you’ll get one in the first place. A special promotion will begin on April 25, where 100 lucky people will win the opportunity to grab a OnePlus One phone first. The thing is, to be in with a chance, you’ll have to obliterate your old phone. Yep, really. You can check out the promo page for more details, but it comes down to you videoing the destruction, and hope it’s unique enough to grab the judges attention. If you win, you get a 16GB phone and three invitations to give away. OnePlus only wants to see you smash up certain phones though, so don’t think you can get away with running over an old feature phone. OnePlus calls the phone “amazingly elegant.” It has decided not to slap its name or logo on the front panel, leaving it very understated. The screen sits in a slightly recessed bezel – just 0.07mm according to OnePlus – and the edges have been machined down to give a contoured finish. The phone will be sold in two colors, Sandstone Black and Silk White, and the standard rear cover is made from cashew nuts – yes, really – making it more environmentally friendly. OnePlus will offer five different rear covers for the One phone, each made to enhance the look, durability, and feel of the device. The styles announced are silk, sandstone, denim, bamboo, and Kevlar. The latter three are all made from their respective materials. The phone has a large 5.5-inch, 1080p touchscreen made by Japan Display, but the device’s overall dimensions remain compact. It’s 8.9mm thick, 152.9mm long, and 75.9mm wide. For comparison, that’s slightly larger than the Galaxy S5, but smaller than the LG G Pro 2. The contoured edges shrink down to 4.6mm at their thinnest point, which OnePlus says will make the device pleasant to hold. The body is made from magnesium and weighs 162 grams, making it the lightest 5.5-inch smartphone out there, and almost identical to the Sony Xperia Z2. A partnership with Qualcomm was rumored back in January, and sure enough, a brand new Snapdragon 801 processor will power the phone, just like the new Xperia Z2 and the Galaxy S5. 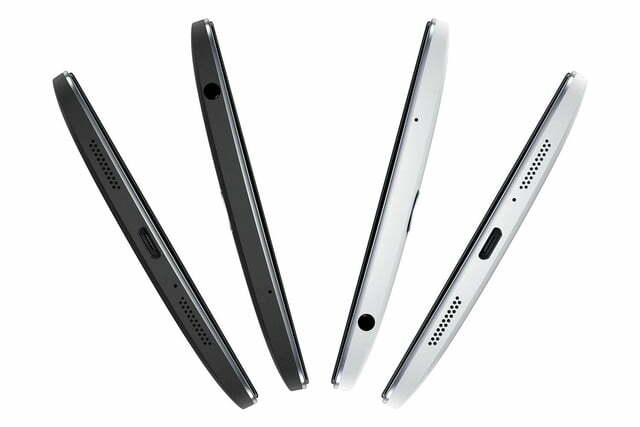 It’ll be backed up by 3GB of RAM, and a 3100mAh battery will be inside the device. Lau says the decision to make it non-removable means it can have a higher capacity, while keeping the device suitably slim. 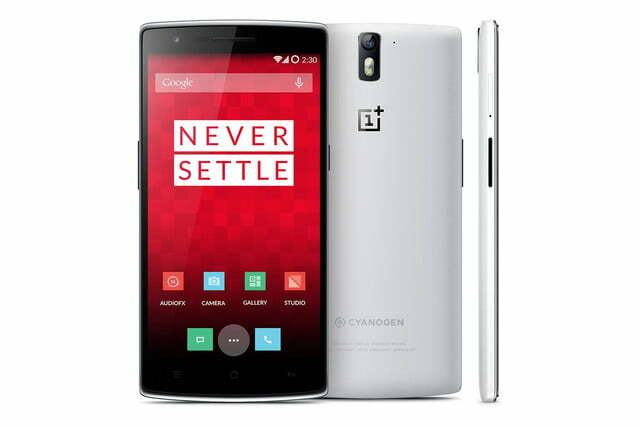 OnePlus’ phone will run Android, but it’ll be a custom version of CyanogenMod. The final spec released concerns the camera, which uses a 13-megapixel, six-element, f/2.0 Sony Exmor IMX214 sensor. Image stabilization and slow-motion recording at 720p will be standard, and a fast 0.3s shutter speed is promised. The camera also shoots video in 4K (Ultra HD), and selfie fans will welcome a 5-megapixel front camera fitted above the screen. It’s claimed the phone is the world’s first to feature down-firing stereo speakers, something which other manufacturers avoid, due to the complexities with fitting them inside the phone. OnePlus has partnered up with JBL to ensure they sound great. The OnePlus One runs Google Android, but it’s a special custom version of the CyanogenMod software, rather than stock Android or one with an in-house user interface. In keeping with current mobile OS trends, the software has a flat, minimalistic style. Although CyanogenMod is designed to be endlessly modified, OnePlus will include various themes and wallpapers to make personalization a little easier. 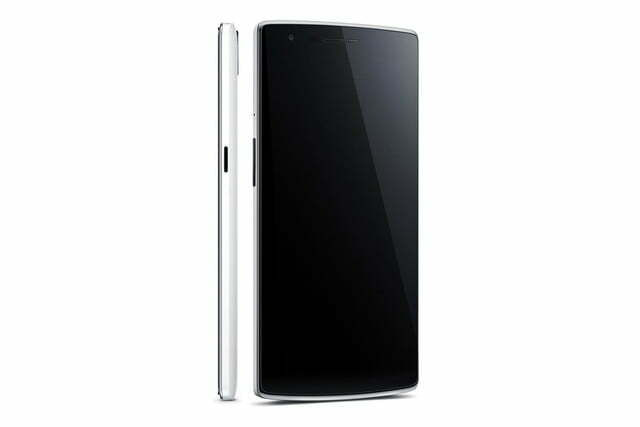 What do you think of the OnePlus One, is it the “flagship killer” smartphone the company says it is? Will you be buying one? Updated on 04-23-2014 by Andy: We’ve added all the details revealed during the event. We’ll be adding more information on the pre-order system during the day. 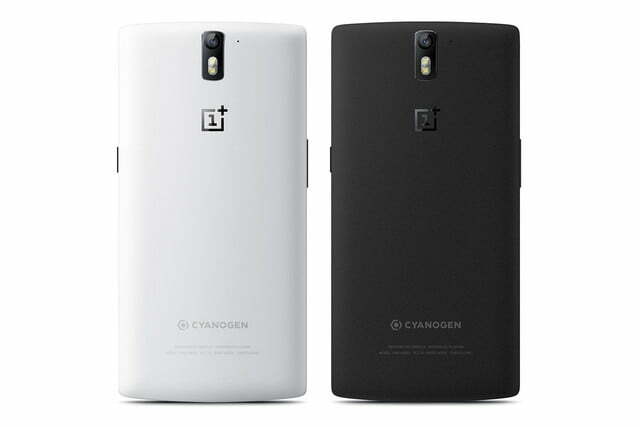 Updated on 04-18-2014 by Andy: We’ve now been given a complete list of where the OnePlus One phone will be released, plus some information on an invitation-style pre-order system.